As winter wanes and spring approaches, wild foodists all across North America tap into the time-honored tradition of sugar production – mainly, the transformation of maple tree sap into maple syrup and sugar. This process, passed on from the Native Americans to the early settlers, is still quite popular today, and is responsible for one of the few wild foods that can be purchased commercially in most supermarkets. Most people associate syrup with the maple tree, and although much of today’s syrup does originate from the sugar maple, all species of maple can be tapped. Even better, many other trees from other genera can be tapped to extract sap, which ultimately can be turned into delicious syrup. In this post, I won’t be discussing the methods involved in tapping for sugar production. If you are unfamiliar with the process, there are a variety of great websites, videos, and books to guide you. Rather, I would like to provide a list of various trees (maples, birches, walnuts, etc.) that you can tap successfully to yield wonderful, sugary products. Now… before we get started, I’m wondering if you’re the kind of person who would rather watch a video than read a blog post. If that’s you, check out this recent video I created. In it, I discuss how to properly identify 4 trees — including 2 maple and 2 birch — that you can tap for sap and syrup production. The sugar maple yields the highest volume and concentration of sap, making it a superior candidate for tapping. Its sugar content is approximately 2.0%. Black maples produce as much sweet sap as sugar maples. The trees closely resemble sugar maples and can be distinguished by their leaves. Black maples tend to have leaves with three major lobes, while leaves from sugar maples have five lobes. Sap yields from red maples are generally lower than those from sugar maples, although some tapping operations utilize only red maples. The trees bud out earlier in the spring, which may reduce syrup quality near the end of sugaring season. Like red maples, silver maples bud out earlier in the spring and have a lower sugar content than sugar maples (1.7% compared to 2.0%). Native to Europe, Norway maples are now considered invasive throughout much of the United Sates. They are not as sweet as sugar maples, yet can be tapped regardless. Also known as Manitoba maple, boxelders can be found growing in urban areas and along roadsides. They’re not recommended as a first choice for sugar production, although maple producers in the Canadian prairies rely almost exclusively on boxelders for their sap. Research suggests that boxelders may yield only half the syrup of typical sugar maples. Bigleaf maple is the main species of maple growing between central California and British Columbia. Native Americans have tapped these trees for centuries, and although the sugar content and sap flow are less than those from sugar maples, these trees can still provide a commercially viable source of syrup for the Pacific Coast. These trees are found primarily throughout the Rocky Mountain states. They also grow in Texas, where they are referred to as Uvalde bigtooth maples. The sugar content is comparable to that of sugar maples, but the volume produced is much less. Rocky Mountain maples are native to western North America, and have been used traditionally by various groups, including the Plateau Natives. Gorosoe, which translates to “The tree that is good for the bones,” is the most commonly tapped maple tree in Korea. The sap is usually consumed fresh as a beverage, and not boiled down to a syrup. The butternut produces a sap that yields roughly 2% sugar – similar to sugar maples. The timing and total volume of sap are also comparable to sugar maples. The black walnut tree is a valuable timber species, whose sap flows in autumn, winter, and spring. It is more common in the Midwest than in the Northeastern United States. A cultivar of Japanese walnuts, heartnuts have sugar contents comparable to sugar maples, but produce much less sap. These are the walnuts commonly eaten and purchased from supermarkets. They are not typically found in the Eastern United States, but rather are grown most abundantly in California. English walnut trees can be tapped successfully, especially when subjected to a freezing winter and spring. The paper birch has a lower sugar content than sugar maple (less than 1%), but is the sweetest of the birch trees. The yellow birch tree has been found to have a higher mineral composition, lower sugar content, and a higher ORAC value (measure of antioxidant capacity) than sugar maple. Native to eastern North America, black birch is most popular for its use in making birch beer. And, as this list suggests, the black birch can be tapped. Found growing abundantly in the southeastern United States, and planted as an ornamental in the Northeast, the river birch can successfully be tapped. Gray birch is more of a shrub than a tree, but may be tapped if it grows large enough. Native to Europe, and grown as an ornamental in urban and suburban areas of the United States, European white birch can be tapped. Native to North America, the sycamore tree has a lower sugar content than sugar maple, yet is reported to produce a syrup that exudes a butterscotch flavor. These trees produce a sap later in the spring, although the sugar content and volume are much less than those from birch trees. And there you have it – a list of 22 trees that can be tapped. This is by no means an exhaustive list, as other trees surely produce a sap that can be extracted through tapping. It is, however, a good representation of the most commonly tapped trees, including those that have been used traditionally for centuries, and some that are just recently gaining in popularity. If you are fortunate to have access to any of the aforementioned trees – and the trees are healthy – explore the traditional art of sugar production by learning and participating in this beautiful craft. Thanks for this list, I was wanting to collect my own next spring. 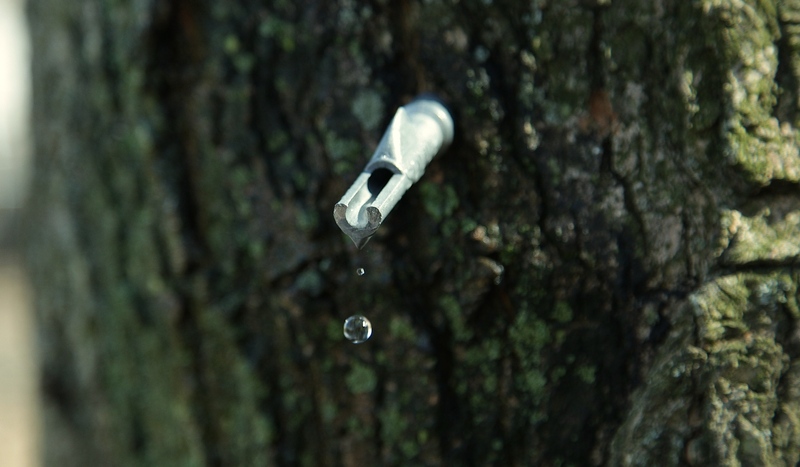 Great post, I know willow trees produce sap, but can it be made into syrup? Has anyone ever done this, is it any good? All deciduous trees push sap up at the start of spring, which have similar natures however they have differing levels of acidity. Tap and taste would be my advise. I have a birch on the go just to have a go. is there a specific variety of sugar maple that is the best for making syrup? What about the Sweetgum tree?